Honda UK has become the first manufacturer in the country to introduce a specialist motorcycle fleet dealer network. This is aimed at growing the corporate market and will provide support and advice to business customers. The service will emphasise the many benefits of doing business on two-wheels. These include high fuel economy, low running costs, low CO2 emissions and increased productivity, as motorcycles take less time to move through traffic. A CBI survey predicting journey times estimates these will increase by 50% within a generation. Unless fleet operators take action, the impact of congestion on businesses will therefore be significant. A Belgian study modelling traffic for one of the busiest roads in Europe shows that when just 10% of car drivers swap to a motorcycle or scooter, congestion is cut by 40% for all road users. When 25% of drivers swap congestion is eliminated altogether. “Congestion will be an increasingly compelling reason for businesses to look at alternatives to four wheels for their fleet vehicles,” says Motorcycle Industry Association (MCIA) CEO Steve Kenward. Other manufacturers are expected to follow. 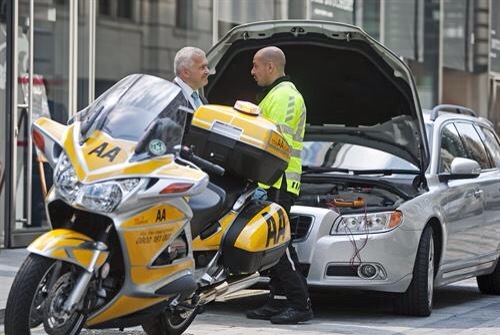 There are a number of successful examples of motorcycle fleet operators, including the police, ambulance service, AA breakdown services and Blood Runners, who courier life saving products between NHS hospitals out of normal working hours. Fleet operators will also be able to find quality trainers more easily, thanks to the launch of two new courses, introduced earlier this year by the Motorcycle Industry Accreditation Centre (MCIAC). This entry was posted in automotive and tagged AA, chrismacgowan, christopher macgowan, Honda, MCIA, Steve Kenward. Bookmark the permalink.